Please use the submit button on the forms to send to the YMCA for processing. If you have any issues, please save the pdf and email directly to tallynsreach@denverymca.org. Also, you may reach us at 720-870-2221. Thank you! 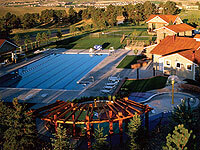 The Tallyn's Reach Pool will be opening for the season this Saturday, May 26th! The pool hours will be Monday through Sunday 10 AM - 8 PM.